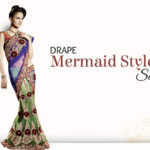 Rajrani Style of Saree Draping is a take on the royal style of wearing a Saree. The Rajrani infuses an element of grandeur that India is known for. This style is perfect for all those august occasions, which require the right mix of subtle show and regal glamour.Typically, Rajrani Style of Saree Draping requires a heavily embellished Saree paired with comfortable heels and complementing Jewelry. Take one end of the Saree and tuck it neatly in the petticoatat the center. Now take the Saree around, bring it to the front & tuck it neatly. Now, hold the Pallu from the back, bring it to the front and make your pleats. Drop it on your right-shoulder, the loose end being a little above your knee. Pin it up now on your right shoulder. Hold the Saree in the middle section and make around 6-7 pleats. This drape is unique because the pleats are tucked in the petticoatfacing the right side. Now, take the Pallu end and pin it up on the left shoulder to make a V.
Always wear your footwear beforehand to get the right length of Saree. 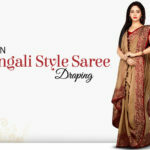 Always pin the Saree at 3 places – Waist pleats, Pallu pleats and Pallu to blouse/top. Add more pins, wherever required, depending on drape styles. Be ready with basic make-up and save time for touch-ups later. 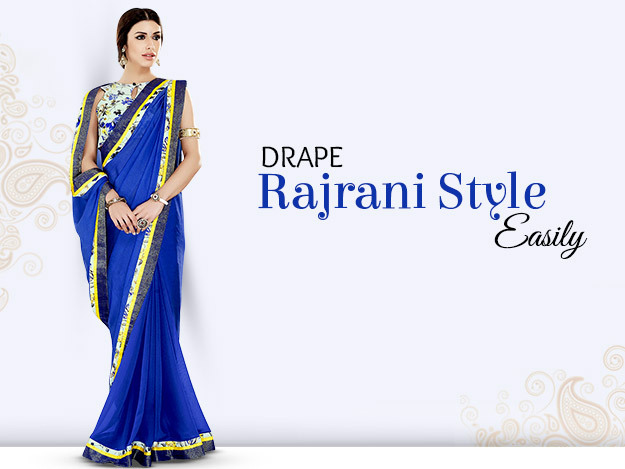 Rajrani is the most Royal drape of all. 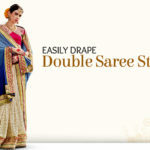 You can choose from embellished sarees, drapes double side borders in rich fabrics like Velvet, Brocade, Jaquard and Silk are most suited for the drape.